In my first post looking at art and the Cochno Stone, I considered the 5,000 year-old tradition of using this domed sandstone surface as a canvas for various creative acts in the form of shallow scratches, deeply incised hollows and painted lines. These surface alterations are ambiguous in meaning, each with their own aesthetic qualities and values, either reducing or adding to the monument, all of them inspiring passionate opinions. 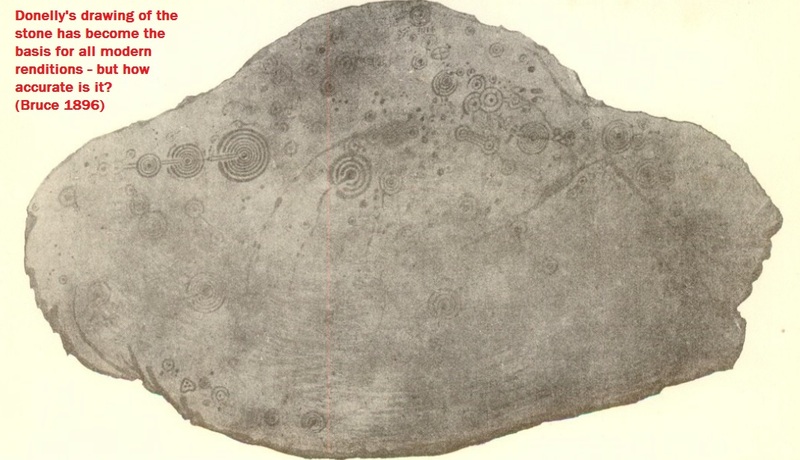 In this second post, I would like to consider the art of the Cochno Stone from another perspective, through the medium of sketches and drawings, specifically those drawn from life (ie before the stone was buried in 1965) over a period between the 1880s and 1930s. No doubt there will be some who will argue that some of these drawings are not really works of art and creativity. For instance, can we regard ‘measured’ depictions of something, technical drawings as part of an archaeological study, as being creative or simply reductive? And what is the archaeological value of studying archive material or newspaper clippings with old drawings when we know with the benefit of hindsight that the drawings are either inaccurate, or incomplete, or both? More fundamentally – and this gets to the roots of much debate on the nature of archaeological narratives – to what extent are these objective renderings of the Cochno Stone? Is such a thing even possible? There are layers of art entangled with art here, the art of art, about art, for art. Prehistoric rock-art lends itself well to contemporary variations in unusual locations, with the simple form and shallow depth endlessly replicatable. Wherever it occurs, if offers a juxtaposition, a curious time slip. Palaeolithic rock-art – cave paintings to you and me – work especially well in this respect, with otherwordly effects as standard. I confess I got this from twitter but have no idea who tweeted it, sorry! More abstract Neolithic and Bronze Age rock-art works is equally portable. This lovely image is in Umea, Sweden, photographed by Lorna Richardson (and reproduced here with permission). This was part of a campaign by the local authorities to promote cycling and draws on the local rock-art repertoire which is a little less abstract than the Scottish equivalents. Many artists have been inspired by the simplicity and concentricity of cup-and-ring marks. Gavin MacGregor wrote about one such artist, Edward Atkinson Hornel (1864-1933), a landscape painter who lived most of his life in and around Kirkcudbright in southwest Scotland, and one of the famous ‘Glasgow boys’. Gavin notes that Hornel consorted with antiquarians and was himself a keen amateur archaeologist, and as it happens, Kirkcudbright happens to be a real hotspot for rock-art (as well as being the location of some shooting for The Wicker Man movie). MacGregor, and the biographer of Hornel, Bill Smith, both draw attention to the echoes of cup-and-ring marks in the depiction of the moon in painting such as The Brownie of Blednoch (1889) and The Druids: bringing in the mistletoe (1890, with George Henry). Gavin notes the former (see above) is dominated by a ‘Gallovoidian shepherd beast, beard of circles and cup-marked eyes … manifestation of the living rock….’. Hornel went as far as to search for new cup-and-ring marked stones and some of his discoveries were recorded in the Proceedings of the Society of Antiquaries of Scotland. It is in the work of the polymath-antiquarian-artist-archaeologist that we find the first recorded artwork associated with the Cochno Stone, with the earliest engagements mediated by various characters of this ilk as well as clergymen. The earliest drawings we have of rock-art in the pages of antiquarians books of the nineteenth century emerged form such a melting pot of influences and interests, blurring the lines between art and objective record, in fascinating ways. Hornel was himself involved in the process of the creation of a series of black and white engravings of Kirkcudbrightshire rock-art, which MacGregor notes were collaborations between a small team and were based on photographs taken of casts made from rock-art panels. This is a period when the first drawings as a matter of record were being produced for cup-and-ring marks, and there was no rulebook, no style guide, no best practice conventions to follow. Artists used licence and produced evocative and memorable images, which often used unusual perspectives and were, for a time, concerned with context and not metrical accuracy. It was also around this time that a young Ludovic Mann became obsessed with cup-and-rings marks near the rural family holiday home, according to Katinka Dalglish, an obsession that would reach its feverish conclusion on the surface of the Cochno Stone to which we now turn. Before going any further in this post, I must also offer the debt of gratitude I owe to Jim Mearns for doing much of the archive research which underpins the history of early drawings of Cochno. Several drawings or sketches of the Cochno Stone were undertaken before 1900, each with a very different style, scope and ambition. (A cast was also taken although the nature and fate of this remains unknown.) These wonderfully capture the emergent understanding of Cochno, presenting only symbols that were initially visible, sometimes selectively so. The gradual reveal of the removal of grass from the stone was played out in these artistic renderings and associated accounts. A partial drawing, defined within a box, was published with the first detailed account of the Cochno Stone, by Rev James Harvey, in 1889. 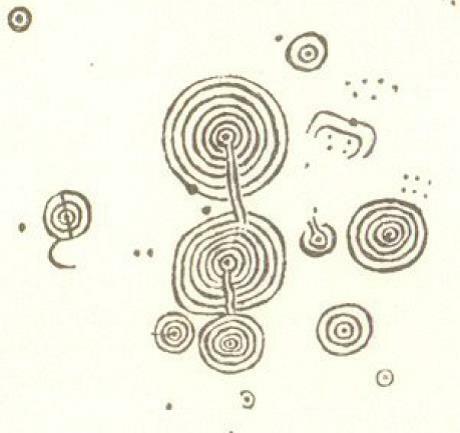 This may well be the earliest drawing we have of any part of the Cochno stone, certainly the first to be published, and it focuses on the only area of the stone cleared when Harvey encountered it. This is a rather plain drawing, with cupmarks represented as dots and dashes, and lacking depth. Harvey himself did the drawings in 1887, but also took rubbings, which he was then able to use to correct his field sketches. 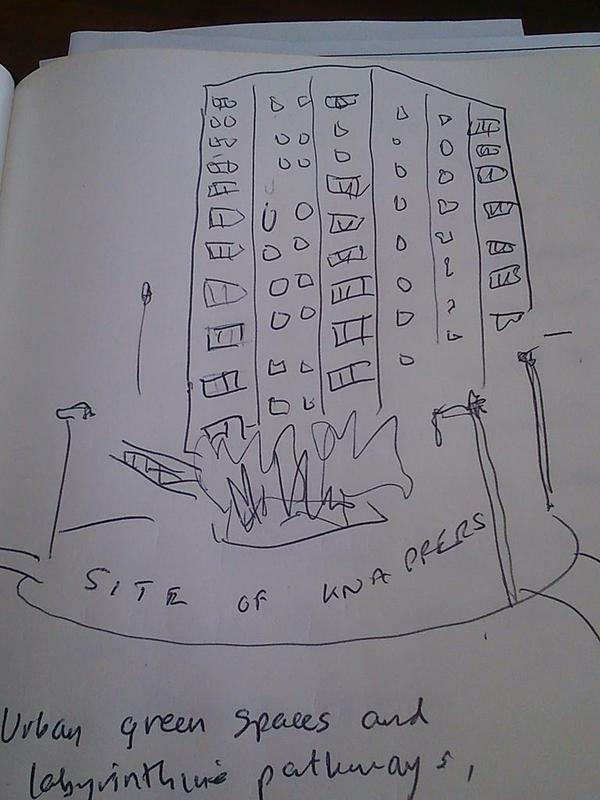 The end product has a sense of immediacy, a work in progress, megalithic notations in a sketchbook. Looking at this sketch now for me is slightly disorientating as east is to the top, but is a welcome break from the tyranny of the north. However, this is also a drawing of some authority, having been published in that august organ the Proceedings of the Society of Antiquaries of Scotland (PSAS). When compared with what we know of Cochno now from our excavation of 2016, some of this drawing is quite fanciful, but it is also an image that has real depth. (The version published by Bruce even has the feel of a rubbing, a nice observation made by Grahame Gardner.) However, unlike Harvey’s drawing, there is no scale here, thus giving the drawing a sense of being more of an artistic and interpretive depiction rather than a document of precise record. This is perhaps the case, as elements of this depiction of the stone are spatially impossible, with symbols simply in the wrong place relative to one another and so this is an image of cup-and-ring mark density, not accuracy. The use of a sharply defined diagonal line allows symbols from another part of the stone – in this case the south-western extent, several metres from the other symbols to be shown in the same drawing, making this a sort of ‘Cochno Stone greatest hits’ compilation. This emphasis on selected bits of the Cochno Stone was countered by the clearing of vegetation, and drawing of the whole monument, by William Donnelly in the mid-1890s, working with John Bruce. Illustrator Donnelly’s drawing of the whole of the stone was published in PSAS in 1896, but a slightly earlier and different version was printed in an edition of Bruce’s History of Old Kilpatrick and includes the artist’s signature and the date – 1895. The slightly earlier drawing, the upper of the two versions depicted below, is notable for its inclusion of a north arrow and some landscape detail that are inexplicably absent from the more widely circulated ‘authoritative’ PSAS version. Donnelly’s drawing from 1895 (top) and 1896. Spot the differences! Donnelly himself was an interesting character, and his illustrations showed an equally bold approach to cup-and-ring mark symbols found elsewhere. 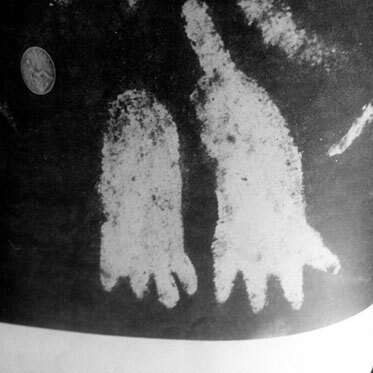 His depiction of symbols of these hoax items found during his excavations (with John Bruce, him again) have echoes of what he saw and drew at Cochno just a few years previously, and suggest a hankering towards the weird and esoteric which he was also able to satisfy at Cochno with his recording of a cross in a circle and two four-toe footprints, neither typical prehistoric motifs. On the cusp of archaeological professionalism, but with visibility and access to archaeological sites still somewhat limited, at the turn of the century such drawings had to be taken on trust. Yet the rise in interest and participation in rambling and hikes in the early decades of the twentieth century allowed less authoritative accounts of archaeological monuments to be composed and disseminated. The only two sketches of the Cochno Stone that I know of from between 1900 and 1965 were both drawn by non-professional archaeologists. The earliest of these was published, firstly in the Glasgow Evening Times newspaper in 1909, and then in the book Some Sylvan Scenes near Glasgow by T C F Brotchie in 1910. This lovely sketch captures a very small fragment of the Cochno Stone focused on a ‘dumb-bell’ motif, sketched at the end of a good ‘Saturday afternoon ramble’. This is a truly artistic rendering, taken from an oblique angle rather than depicting the plan view, with no scale, no north arrow, no conventions – but a sufficiency of dynamism. The rings around the cup have a real sense of mobility, almost as if the symbols were spinning in front of Brotchie’s eyes. There is also a synechdotal quality to this sketch, a gutter running off the right-hand side of the drawing hinting at more to be discovered (and drawn) beyond the frame. Such dynamism is also evident in another Cochno Stone drawing, one which I have reproduced before, notably in the excavation summary report. 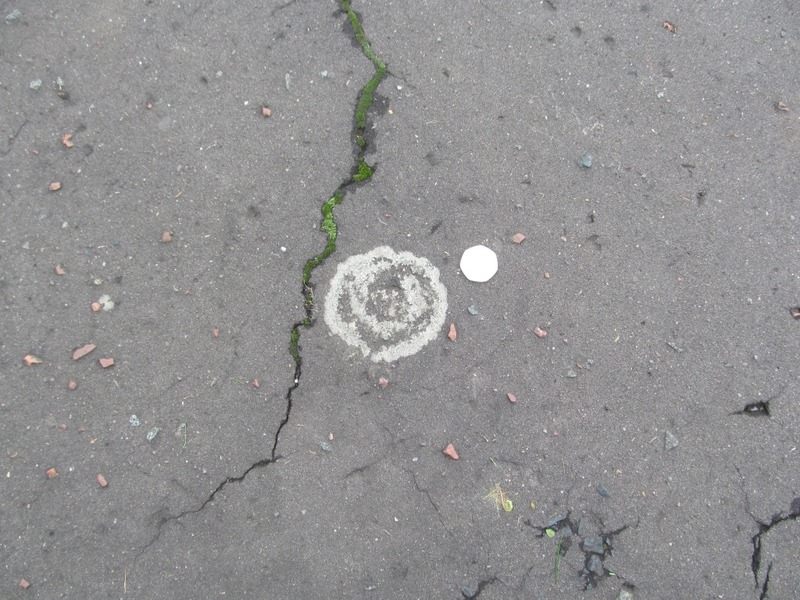 Ludovic Mann’s audacious attempt to explain the cosmological meaning of each ring of a cup-and-ring mark complex is as mind-blowing now as it must have been when published in the late 1930s as part of a consideration of the Knappers site he had been excavating in nearby Clydebank. Source: Mann’s 1939 booklet The Druid Temple Explained. This ‘dialectogram’ (for the wonderful work of Mitch Miller is one of the best parallels I can think of here) is an amalgam of all the other Cochno drawings to that date. There is convention. There is artistic licence. There is narrative. 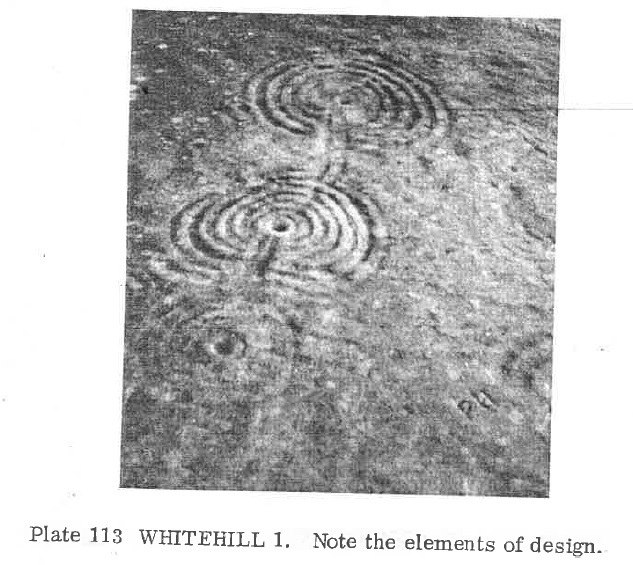 There is a focus on the giant cup-and-ring mark motifs on the upper reaches of the Cochno Stone that also featured prominently in the drawings of Munro, Harvey and Donnelly. There is passion. And there is wonder. And there are more questions than answers. Always more questions than answers. All of these Cochno Stones drawings, produced over a period of forty years, offer a series of dynamic and creative attempts to document and make sense of the cup-and-ring marks, using the conventions and styles of their time and channeled through the personal motivations and passions of the artist-recorder. In their own ways, each of these drawing is a version of the Cochno Stone that captures some of the character of the rock and its symbols and taken together they form a compelling biography of this place, another chapter of a story that began to be written (before there was writing) 5,000 years ago. What I especially find alluring about this collection of drawings is that they were drawn from life – by actually standing at the site and looking at the stone. This is where Morris’s much reproduced drawing of the stone falls short – it was cobbled together from the plans by Harvey and Donnelly, and some photographs from the 1930s. While it was (until our photogrammetric and laser survey of 2016) the most comprehensive drawing of the Cochno Stone produced, it creaks at the edges with the slightest bit of scrutiny especially when compared with earlier, more dynamic, drawings. It is clinical, transactional, flat. Morris, a solicitor, was a lateral thinker. To really start to make sense of rock-art, concentric thinking is required. One of the most common questions that I get asked about the Cochno Stone regards the meaning of the symbols, and regardless of how accurately we record and draw the cupmarks and the cups-and-rings and the gutters, that meaning cannot be revealed to us. Therefore, despite the formal and technical shortcomings of some of the earlier drawings of the Cochno Stone, these are no more or less likely to help make sense of the symbols than any image we could generate now that was mediated through digital technology. In this case at least, the pencil is no more or less mighty than the pixel. The joy of the art of the Cochno Stone – and indeed any abstract rock-art – is not about accuracy, or precision, but about mediation, dialogue, spending time with the stone, tracing the contours of the prehistoric depressions with our fingers. There is much merit in standing back and letting a laser scanner do its thing, or viewing the stone through the lens of the camera. But drawings and sketches involve a powerful intimacy that mirrors the acts that created the rock-art in the first place. Forget the scales. We don’t need north arrows. Making sense of rock-art is about thinking concentrically, not metrically. 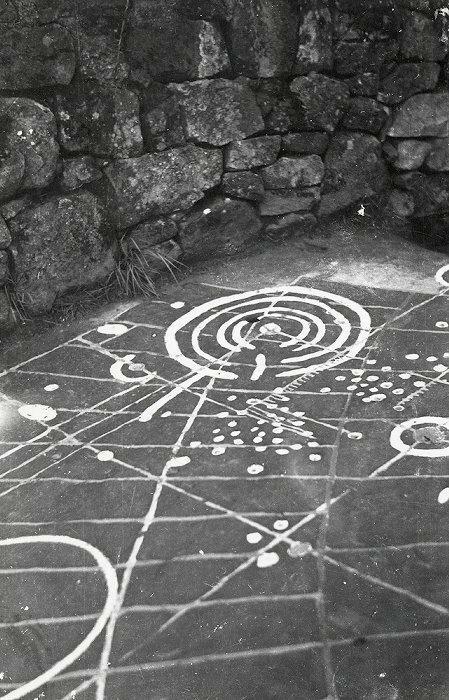 In the final part of my series of posts looking at the art of the Cochno Stone, I will consider art and creative acts that have been inspired by the Cochno Stone, but that exist spatially somewhere else. In some cases they have only had a brief existence or do not exist at all. A mural, a comic book, Chalkno stones and inspired architectural design all attest to the power of Cochno to provoke a response and empower. Sources and acknowledgements: as noted in the post, the story of the antiquarian and early drawings of the Cochno Stone could not have been told without the research and diligence of Jim Mearns. 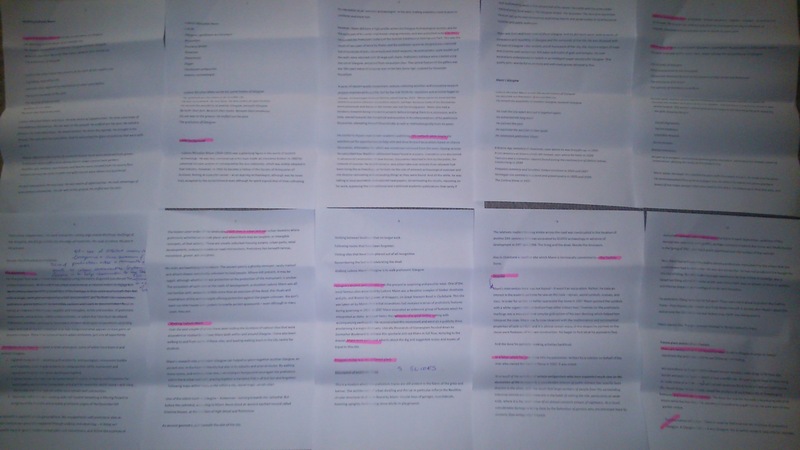 Thanks also to Katinka Dalglish, Gavin MacGregor and Alex Hale for the input that their research has had on this post and I have linked to their work where possible. For more on Donnelly and Dumbuck, you can download for free Alex and Rob Sands’ book Controversy on the Clyde: archaeologists, fakes and forgers from here. The biography of Hornel alluded to is Bill Smith’s 2010 book Hornel: the life and work of Edward Atkinson Hornel. 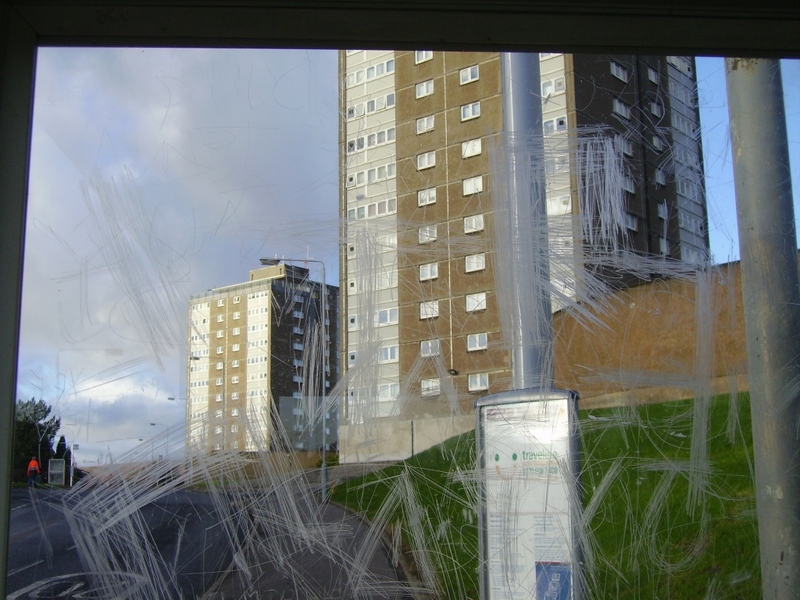 I’m also very grateful to Lorna Richardson for both allowing me to use her Umea photograph, but giving me some background context for the image. The High Banks rock-art drawing came from Hamilton’s paper in PSAS 23 (1888-9) ‘Notice of additional groups of carvings of cups and circles on rock surfaces at High Banks, Kircudbrightshire’. The Stronach rock-art sketch comes from Somerville’s PSAS article, ‘Notice of cup- and ring-marked rocks on the Stronach Ridge, near Brodick, Arran’ (volume 35, 1900-1901). All PSAS articles can be downloaded free. 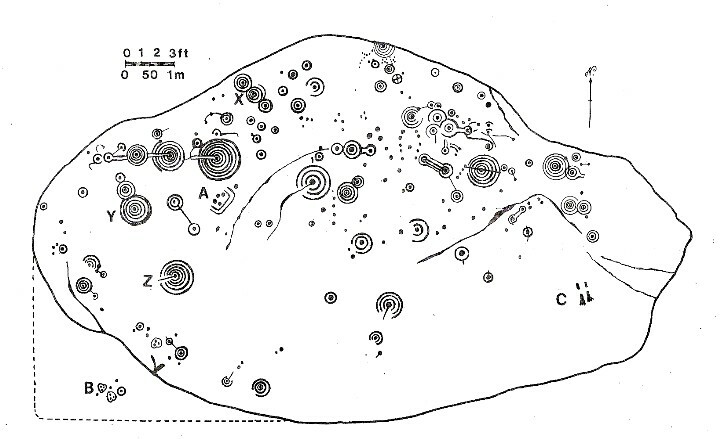 Ronald Morris’s drawing of the Cochno Stone comes from his 1981 BAR volume The prehistoric rock art of southern Scotland (except Argyll and Galloway). Is art an appropriate word to describe the abstract symbols that were carved onto rock outcrops in the Neolithic and Bronze Age in Britain? I was asked this question a few times recently during a series of talks I did about the Cochno Stone and it is a question that causes us to pause and reflect on the way that contemporary discourse shapes our perceptions of the ancient past. Our vocabulary is simply insufficient to characterize activities that happened in prehistory, and inevitably we end up writing narratives about the past that are pale reflections of, or weird variants on, our own present. You do not need to be a student of archaeological theory to understand that this is both problematic and inevitable. Art is a word that polarizes in general, and especially so in the context of prehistory (for an interesting discussion on this issue, read this). Some archaeologists see the word art in this context as useful in helping us to understand some of the complexities of pictorial and abstract carvings on rock from prehistory. Others accept that while inadequate and loaded, we are stuck with the rock-art label: it is a widely understood term that is simply a classificatory label. No classification can ever be really neutral, however, and so while rock-art cannot now be easily abandoned as a descriptor, we should use it cautiously and critically. For me, art is something that provokes creativity, stimulates critical thinking, offers a fresh perspective on the world around us, and is deeply political. For others, art is about creativity and aesthetics. Can we say the same for rock-art? Can we apply the same criteria for reading art gallery art in our readings of prehistoric rock-art? Perhaps. I could go on. 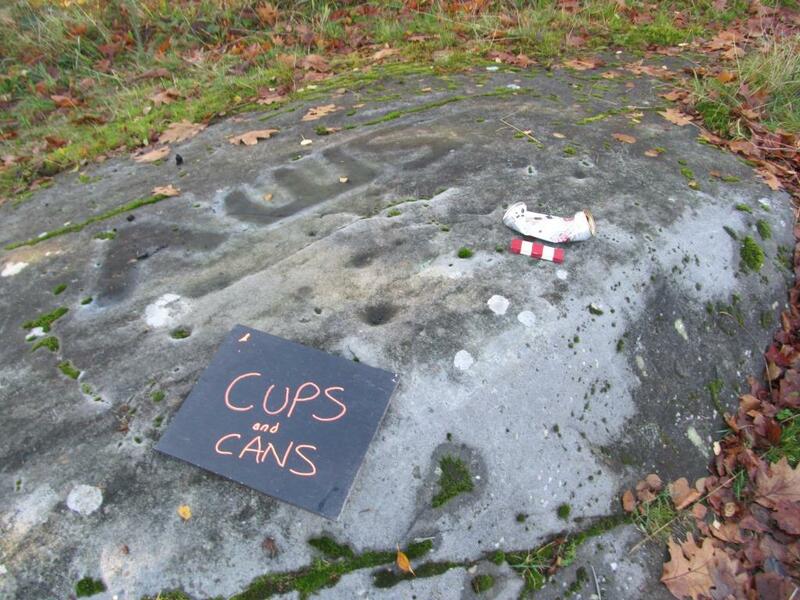 What I am trying to say here is that there are many ways to make sense of cup-and-ring mark rock-art, and by thinking about it as ‘art’ we open up routes to interpret such symbols in ways that make sense to us. 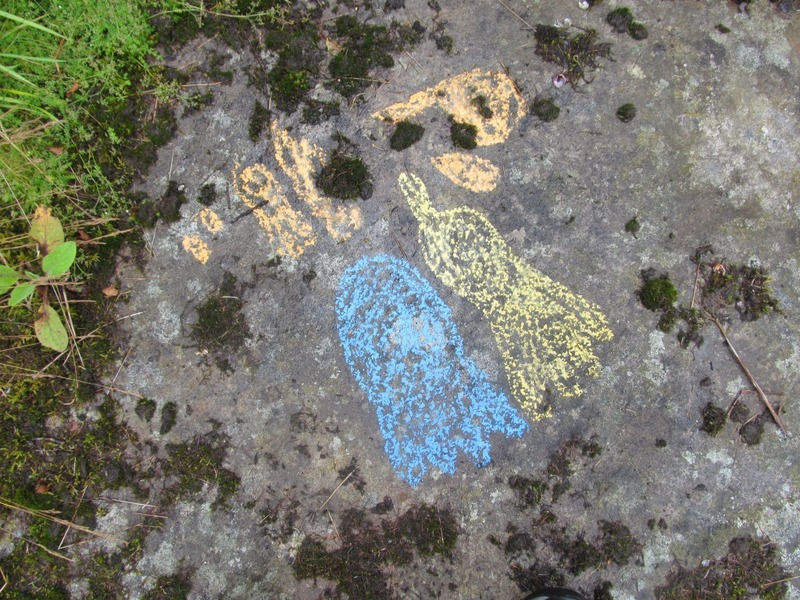 One thing that art is good at is inspiring more art, and in this spirit, over two posts, I want to consider artistic responses to the Cochno Stone rock-art site. In this post, I will look at art that has been applied to the surface of the stone itself, and then in the second I’ll consider art inspired by the rock-art (I’ll add a link here once this has been posted) in the form of public art, sketches, measured drawing and comics. Together I hope these posts will offer an artistic and visual history of this amazing monument but of course there is no chance I’ll settle the old ‘is rock-art art argument’…..
Let’s leave aside the prehistoric carvings on the surface of the Cochno Stone. Whether these are art or not depends on you and ink has been spilled on these elsewhere. These symbols were carved into the rock probably between 3000BC and 2000BC for purposes unknown, but using a huge amount of skill and expertise. These creative acts, probably spread over a period of many decades of centuries, marked this place out as somewhere special, and ever since then people have been unable to resist the temptation to add their own elements to this huge communal rock canvas, with startling different motivations and outcomes. The images below show prehistoric symbols and twentieth century (AD) additions, almost blending seamlessly together, a palimpsest in sandstone. ‘two new features which had not hitherto been observed, viz, a cross within an oval border, and a sculpturing resembling two pairs of footprints, which …. show only four toes each’. Are these genuine if unusual prehistoric symbol, or were these weird feet (or hands) added at some point in the millennia since the cup-and-ring marks were carved? We may never know. The cross is not a Christian cross, and so we cannot assume this belongs to the historic period. Perhaps these are prehistoric. Such subversions of the typical rock-art forms may have been especially powerful in prehistory, perhaps as impactful and shocking as other radical new art styles and pieces that have punctuated history, the Bronze Age equivalent of Tracy Emin’s unmade bed. Antiquarians appear to have responded to the Cochno Stone symbols in a more boring way, adding their name as was their wont. During the 2016 excavations we recorded two examples of historic graffiti that appeared to be written in bookplate text: W KERR and W CARMICHAEL, which probably date to the nineteenth century and would have been regarded as unworthy of recording by their peers. This photo, which I took in 2015, is complex, containing the antiquarian graffiti of the aforementioned Cursiter from 1891 but also ‘FH’ from 2000. Which, if either, have the value of creativity? Is this historic graffiti or vandalism? Is it art? (And don’t get me started on the Viking graffiti in Maes Howe…). As Hugo notes in his model, however we view this, it is now illegal to deface this monument as it is a scheduled ancient monument, so FH better keep their head down. Similar conundrums are posed by the next major intervention on the surface of the Cochno Stone. 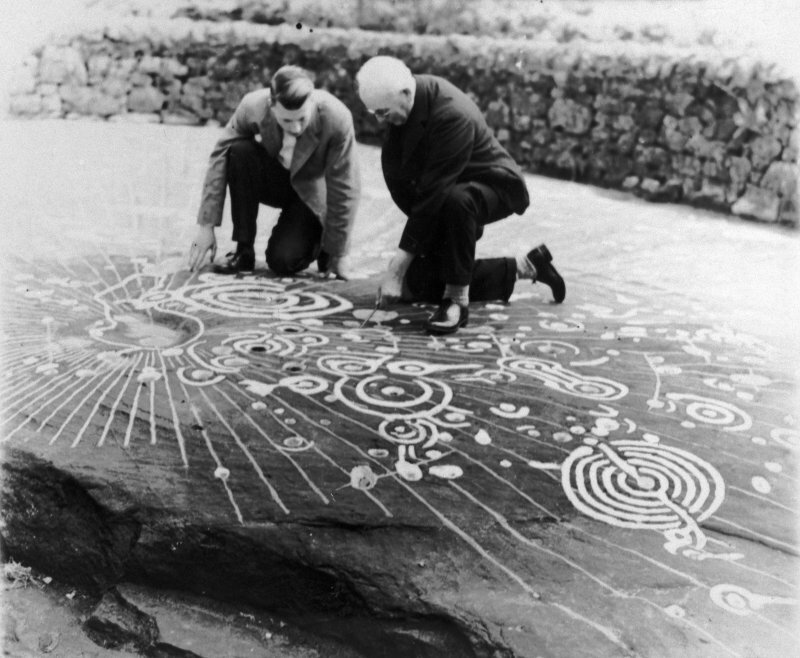 Into the twentieth century, the symbols on the Cochno Stone inspired more intensive artistic engagements, not least the work of Ludovic McLellan Mann, whose painting of the Cochno Stone in 1937 was one of the truly transformative events in the history of this monument. Aside from offering a colour-coded translation and abstract analysis of the meaning and properties of the design, Mann’s efforts could and should be viewed as a creative act. This oil paint job was creative in other ways, with for instance two circles added to the surface of the stone, such as the red and white symbol in the image above, another layer of depth and obscure meaning as if Cochno needed any more depth and obscurity. One of Mann’s long straight yellow lines crosses the circle, almost as if he was revising his theories as he went along. Making sense of Mann’s brushstrokes is as much an act of interpretation as is needed for any artwork where we know little of the intentions of the artist. Having used oil paints, as recent analysis by Louisa Campbell of the HES-funded Paints and Pigments In the Past project (PPIP) has demonstrated, it seems likely that Mann’s palette was the paint shelf of a 1930s ironmongery. Even the drawing of the Stone, based on Mann spending a lot of time (perhaps more than is healthy), has an artistic quality that transcends mere recording because it is hardly an objective rendering. This image, the only drawing that Mann published related to the Cochno Stone, in 1939, is a fictional account of the meaning of the symbols, creative writing, one page from a wonderful graphic novel that he didn’t ever get round to finishing. 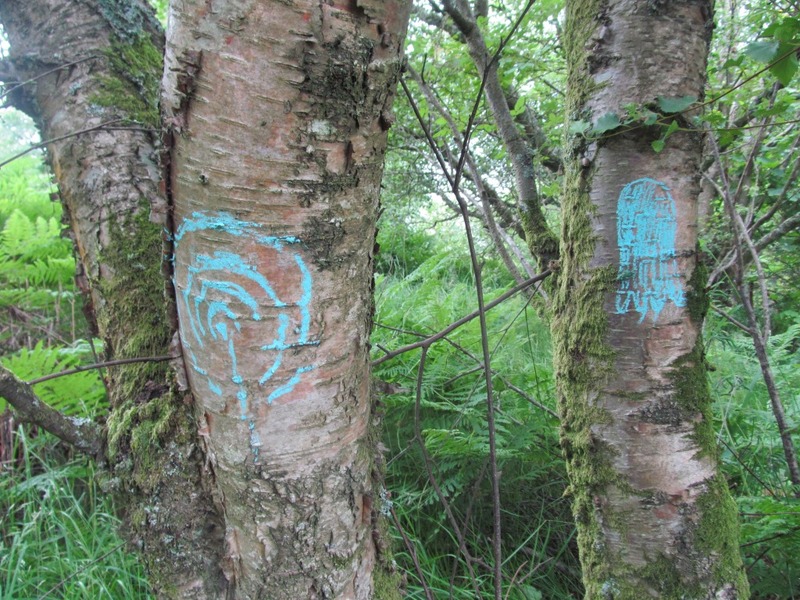 The grand canvas of Mann’s work contrasts with the more private and modest acts of graffiti that occurred with increasing intensity in the years leading up to the Cochno Stone’s burial in 1965. These actions did not have the facade of academic research that Mann may have hidden behind, although even his actions were frowned upon by the owners of the stone and the ‘establishment’. The memo below was written at best a couple of months after Mann painted the stone; the stone would become a scheduled ancient monument by the end of the year. 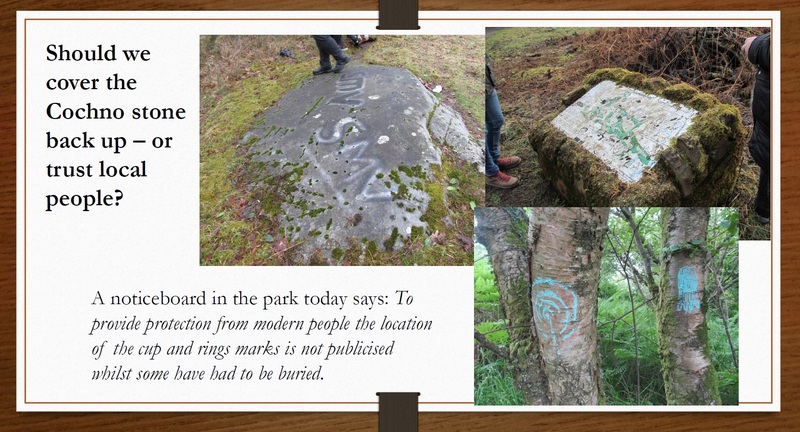 The legal protection of the Cochno Stone did not stop people making their mark on the surface, and I suspect that no-one from the Office of Works bothered to tell local people or visitors of the change of status anyway. Thus what Mann started, only the burial of the stone could stop. And frankly, if Mann could paint the stone up a storm, why could others not make their own modest additions? 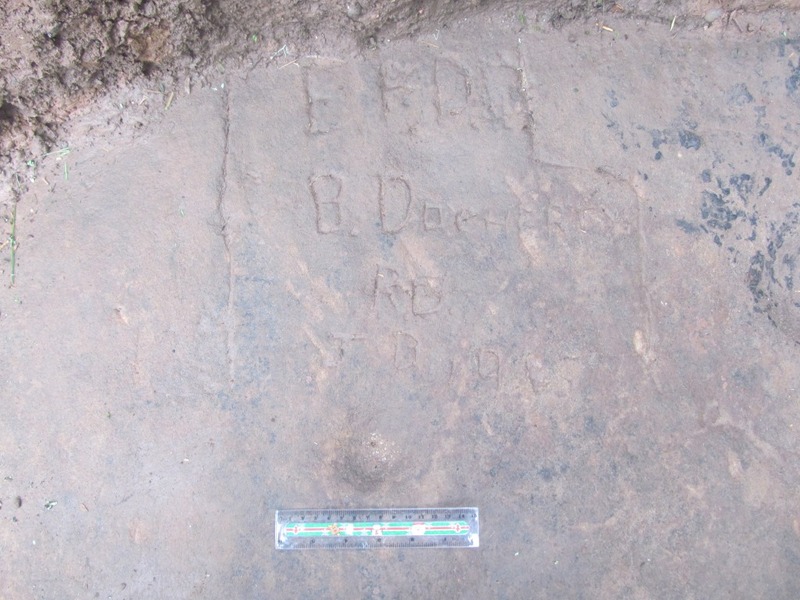 Research by University of Glasgow postgraduate student Alison Douglas has shown that over 100 modern marks were made on the surface of the stone, mostly dating to between 1940 and 1965, overwhelmingly in the form of names, dates and initials. Individual expression seems to have taken different forms, including weak attempts to replicate the prehistoric symbols, as this image from the online Cochno Stone viewer suggests. Other graffiti showed a desire to be inventive – spirals and swirls were added to names to give a touch of class, a set of initials were displayed inside a simple depiction of a house while some names were connected with arrows, suggesting relationships were being depicted here too, stone genealogies. This art came at a cost. I recently spoke to someone who as a child carved his name onto the surface of the Cochno Stone with his penknife, which was broken in the process. Sacrifices have to be made to make one’s mark on the world. One wonders what personal cost Mann’s obsessions had for him. And ultimately, the creative encounters discussed above culminated in the shutting down of this site, the burial of the stone beneath tons of soil for contravention of the rules in 1965. Maybe we should charitably view the covering of the Cochno Stone itself as a grand piece of performance art that almost no-one was fortunate enough to witness. There is no doubt that art and creative interventions on the surface of archaeological sites can be contentious. I don’t want to make light of the potential problems in site management and interpretation that paint, carvings and worse can cause and there are some horrible examples of crude painted messages added to rock-art around the world should you wish to google. However, in the case of the Cochno Stone, there is a rich history of additions to the surface of the stone that cannot simply be written off as mindless vandalism as some other examples clearly are. Indeed, if we view one of the roles of art to inspire creativity in others, then at this level the Cochno Stone succeeds as an open air installation that was and remains a constant source of inspiration. The examples in this blog post suggest that these interventions – both permanent and temporary – have been going on for some four or five thousand years. I will explore alternative mediums in part 2 when I consider the history of art inspired by the Cochno Stone that is not on the surface of the monument but located elsewhere – on the sides of buildings, on the trees and pavements, in the pages of journals and newspapers, and in a wonderful little comic book. Whether you think rock-art is art or not, art sure follows it around. Sources and acknowledgements: I would like to thank Alison Douglas for her ongoing analysis and research into the historic graffiti on the Cochno Stone, and for the community of Faifley for their indulgence and support. Thanks also to Grahame Gardner for drawing (ha ha) my attention to the Francis Hitchings’ book Earth Magic. Bruce, J 1896 Notice of remarkable groups of archaic sculpturings in Dumbartonshire and Stirlingshire, Proceedings of the Society of Antiquaries of Scotland 30, 205-9. Mann, L M 1939 The Druid Temple Explained. London & Glasgow. This is a slightly updated version of the text of a paper I gave at a conference held in the Pearce Institute, Govan, on Saturday 17th October 2015. The event was ‘EcoCultures: Glasgow’s Festival of Environmental Research, Policy and Practice’ and it was organised by Glasgow University PhD students Kirsty Strang and Alexandra Campbell. For more information on this excellent event, see the festival Facebook site and twitter feed (@EcoCultures, #EcoCultures). I believe podcasts of lectures and round tables will be made available soon; I will update the blog to include a link when this happens. I would like to thank the organisers for inviting me to contribute. Ludovic McLellan Mann wrote the secret history of Glasgow. He sketched out the shape of an invisible city. He sensed the possibility of another Glasgow, beneath Glasgow. Beneath their feet. Beneath their trams. Beneath their omnibuses. Ludovic McLellan Mann was present at the birth of this modern city. A process that required the eradication of what came before. The quarrying away of the past. The burying of the ancient. The price that had to be paid. Ludovic McLellan Mann was busy. He was aware of opportunities. He took advantage of serendipitous discoveries. His ear was to the ground. He sniffed out the past. He called in favours. He took advantage. He seized control. He drove the agenda. He brought in his friends, the suits and the specialists. And he welcomed the glare of publicity that went with all of it. Bronze Age pots and chunks of cremated human bone were extracted from graves. Prehistoric stone coffins were dismantled in newly created back gardens. Neolithic pits, hollows, quernstones and hearths were rescued from the quarry face. Ancient carvings on rocks in parks and golf courses were drawn and quartered. He was everywhere. He was busy. He was aware of opportunities. He took advantage of serendipitous discoveries. His ear was to the ground. He sniffed out the past. He was everywhere. He was busy. He was aware of opportunities. His ear was to the ground. He sniffed out the past. 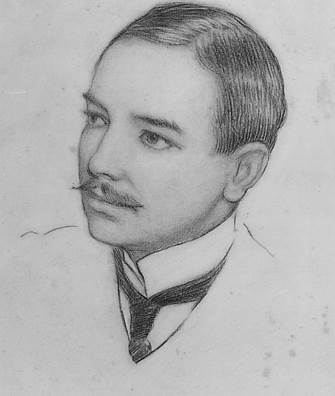 Ludovic McLellan Mann (1869–1955) was a polarising figure in the world of Scottish archaeology. He was less controversial in his main trade: an insurance broker. In 1900 he patented his own system of consequential fire loss indemnity, which was widely adopted in that industry. However, in 1901 he became a Fellow of the Society of Antiquaries of Scotland, hinting at a parallel career – as an aspiring archaeologist, although was he never truly accepted by the establishment even although he spent a good deal of time cultivating his reputation as an ‘eminent archaeologist’. In the end, leading academics took to print to condemn and mock him. However, Mann did have a high profile within the Glasgow Archaeological Society, and for the early part of his career had broad-ranging interests, and was published widely. 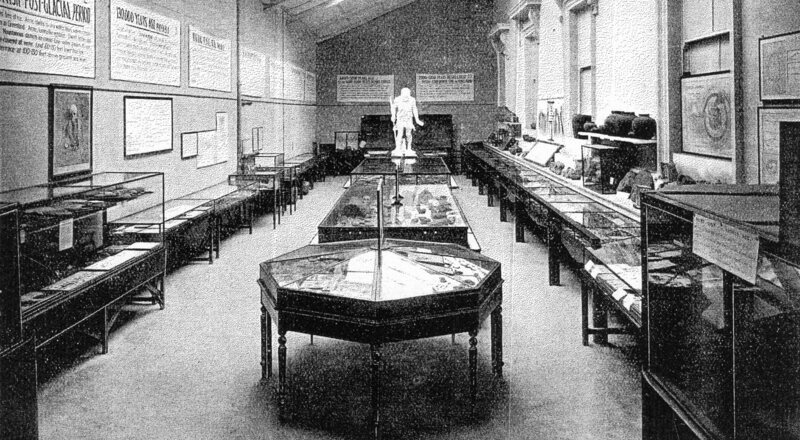 In 1911 he curated the Prehistoric Gallery of the Scottish Exhibition in Kelvingrove Park. This was the result of two years of work by Mann, and the exhibition space he designed was crammed full of hundreds of pots, stone tools and metal weapons, reconstructions, scale models and the walls were adorned with 16 large wall charts. Prehistoric tableaux were created using the soil of Glasgow, extracted from excavation sites. The central feature of the gallery was the ‘life-sized statue of a typical man of the late Stone Age’ sculpted by Alexander Proudfoot. A series of decent quality excavations, eclectic collecting activities and innovative research projects maintained his profile, but by the mid-1920s his reputation and activities began to change. Archaeologist Graham Ritchie noted that by 1923: ‘Mann seems to have lost the ability to prepare coherent excavation reports, perhaps because some of his discoveries were piecemeal and because site survey was not his strong point’. Mann also had a tendency towards losing interest in projects before bringing them to a conclusion, and in time, veered towards the fantastical and eccentric in his interpretations of his prehistoric discoveries, alienating himself theoretically as well as methodologically from his peers. He started to bypass mainstream academic publishing. His methods were simple. He watched out for opportunities to help with and drive forward excavations based on chance discoveries, information for which was sometimes retrieved from the news clipping services he subscribed too. Neolithic settlement traces found in a quarry. Cremation urns discovered in advance of construction of new houses. Discoveries reported to him by the public, his network of sources. He would move in, and either take over entirely from whoever had been doing the archaeology, or he took on the role of eminent archaeological overseer and site director recovering and excavating things as they were found. And all the while, he was talking to local journalists and national newspapers, disseminating his results, reporting on his work, bypassing the conventional and traditional academic publications that rarely if ever published his work in the second half of his career. His outlet was the print media: national press, local papers. The Glasgow Herald. The Scotsman. The Express. The Hamilton Advertiser. He even set up his own eponymous publishing imprint and spoke widely to local historical societies and public audiences. Mann was born and lived most of life in Glasgow. And he did much work, both in terms of excavation and recording, in Glasgow and the surrounds of the city. He was obsessed with the past of Glasgow – the ancient, occult framework of the city, the obscure origins of roads and churches and cemeteries, folk takes and myths of gods and temples. His own excavations underpinned his beliefs in an intelligent pagan ancestry for Glasgow – fine quality pots, wonderful stone tools and well-made graves attested to this. He took the city apart and put it together again. He extracted the long dead. He exploited the past for its own good. After his excavations, like a serial killer, he kept souvenirs – tokens – trophies – to remind him of his work. 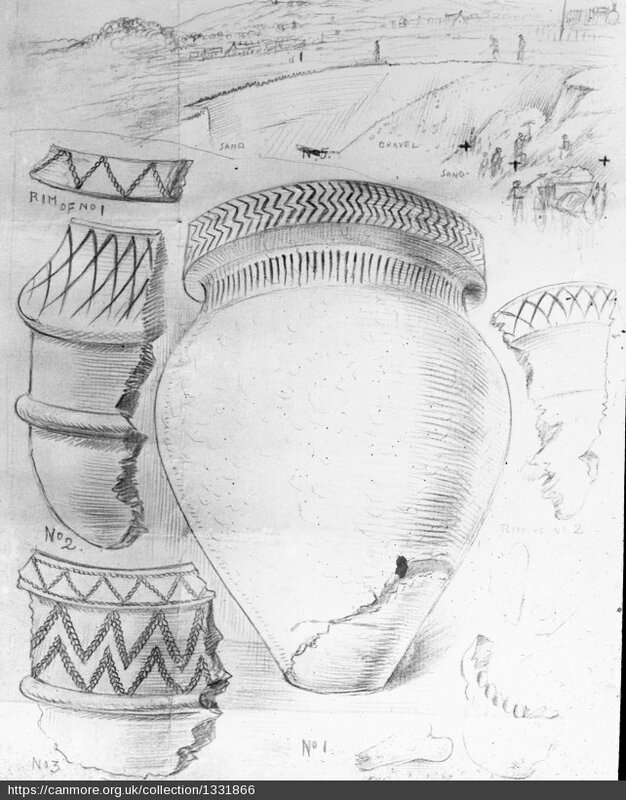 The Bronze Age cinerary urns from his first prehistoric dig in Glasgow, at Langside, remained in his possession until his death 50 years later. 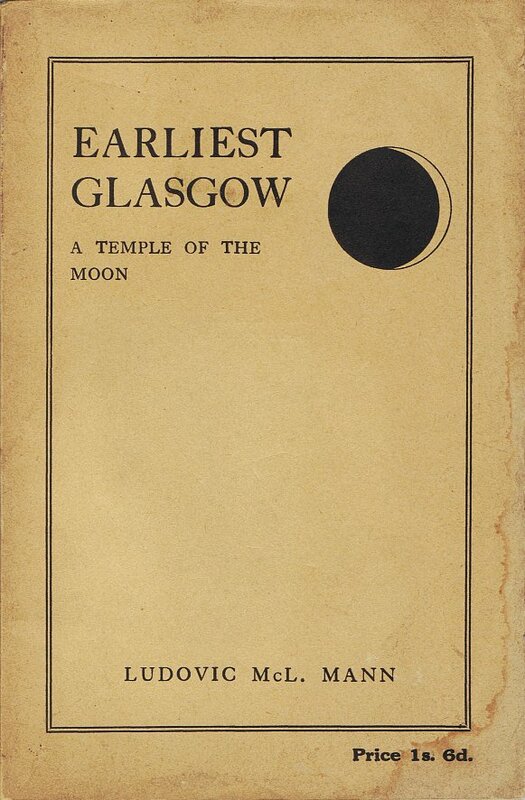 Mann wrote a book on prehistoric Glasgow – a pamphlet he published in 1938 called Ancient Glasgow: A temple of the moon. 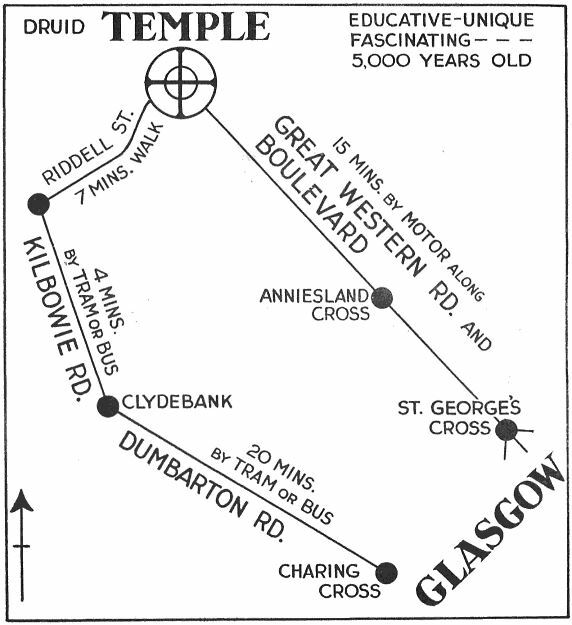 Here, Mann laid out the occult history of Glasgow. Ancient gods, ancient places, ancient traditions, ancient mounds, ancient temples. All beneath the modern grid plan of the city. Hidden – but still there is you knew where to look, where to walk. The ancient sacred geometry of Glasgow still informing the grid. Powering the grid. Shaping the grid. All part of a network, connections spanning time and place, subverting the straight jacket of urbanisation, defying the order of the modern city. Mann wrote the book. He created the past, with his trowel, his pen, his chalk and his paints. He reconceptualised Glasgow as a pagan city. He held in his hands the ashes and burnt bones of the noble savages that once lived in this place. He looked upon their fine pots, and their sharp, elegant axes. His work was at the cutting edge and on the fringe: the fringe of the discipline, the fringe of the city, the edge of modernity, the cusp of science, the past in the present. He was the first urban prehistorian. Over the past couple of years I have been visiting the locations of various sites that were excavated or studied by Ludovic Mann both within and around Glasgow. Mann’s research into prehistoric Glasgow can helped us piece together another Glasgow, an ancient one, in the heart of the city but also in its suburbs and arterial routes. By walking these routes, and visiting these sites, I am trying to foreground once again the prehistoric within these urban contexts, piecing together a narrative that is all but lost and forgotten. Following maps within maps, a city within a city, secret maps, secret cities. 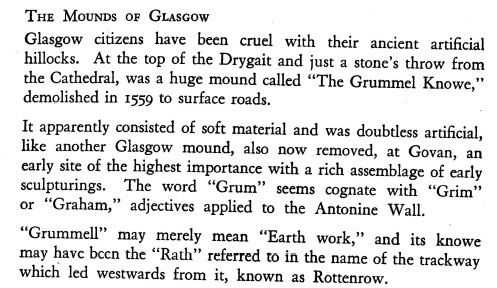 One of the oldest roads in Glasgow is Rottenrow, which runs towards the cathedral from the city centre. But before the cathedral, according to Mann, there stood an ancient earthen mound called Grummel Knowe, at the junction of High Street and Rottenrow. An ancient geometry, just beneath the skin of the city. Walking between locations that no longer exist. Following routes that have been forgotten. Visiting sites that have been altered out of all recognition. Remembering the lost and celebrating the dead. Walking Ludovic Mann’s Glasgow is to walk prehistoric Glasgow. Glasgow’s ancient past intrudes into the present in surprising and peculiar ways. 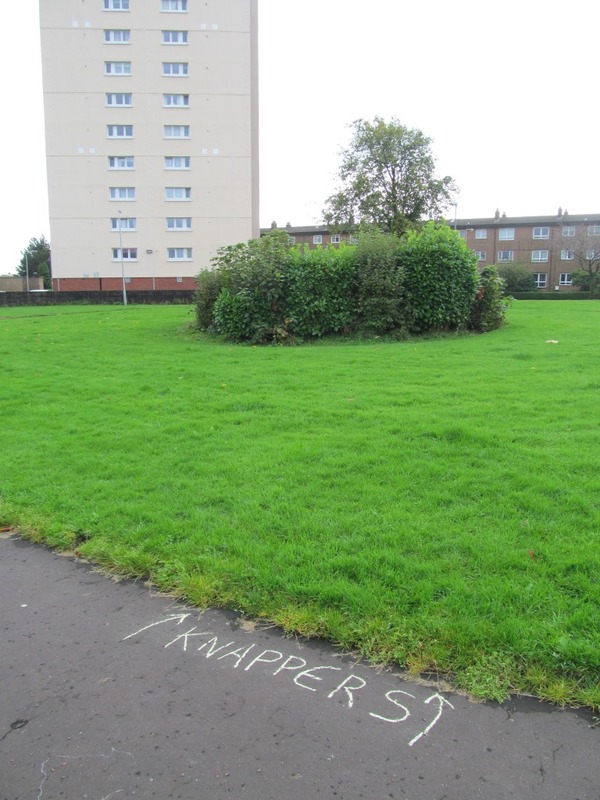 One of the most famous sites excavated by Ludovic Mann was a Neolithic complex of timber structures and pits, and Bronze Age graves, at Knappers, on Great Western Road in Clydebank. This site was taken on by Mann after initial excavations had revealed a series of prehistoric features during quarrying in 1933. 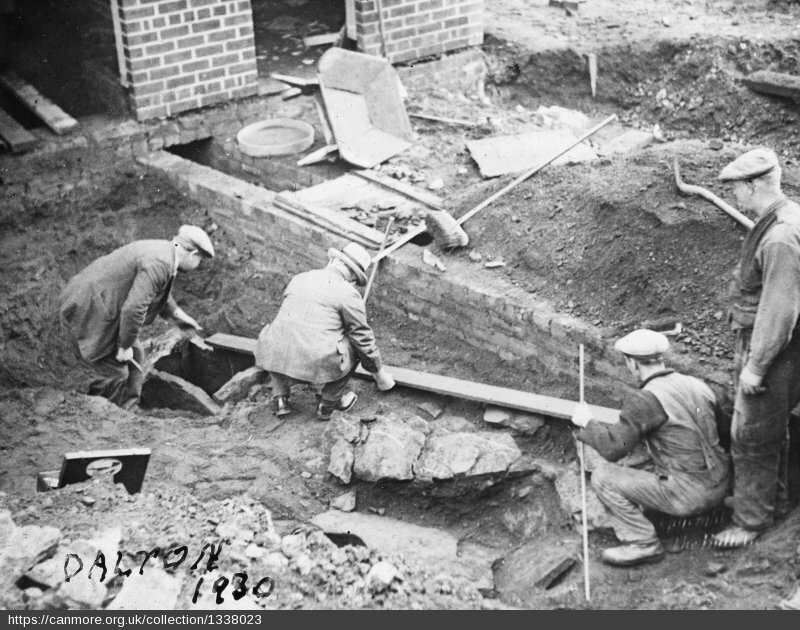 In 1937 Mann excavated an extensive group of features which he interpreted as stake- and post-holes, the remnants of a spiral timber setting with accompanying earthworks. He reconstructed this monument and went on a publicity drive, proclaiming it a major discovery. Literally thousands of Glaswegians headed down to Duntocher Boulevard to witness this spectacle and see Mann in full flow, lecturing to the masses. Mann even published adverts about the dig and suggested routes and means of travel to this site. Knappers today is a very different place. This is a location where the prehistoric traces are still evident in the fabric of the grass and tarmac. The architecture of urban dwelling and the car in particular reflects the Neolithic circular structures that were found by Mann: circular bays of garages, roundabouts, towering uprights, landscaping stone blocks in playgrounds. The relatively modern housing estate across the road was constructed in the location of another Early Bronze Age cemetery that was excavated by GUARD archaeology in advance of development in 1997 and 1998. The living on the dead. 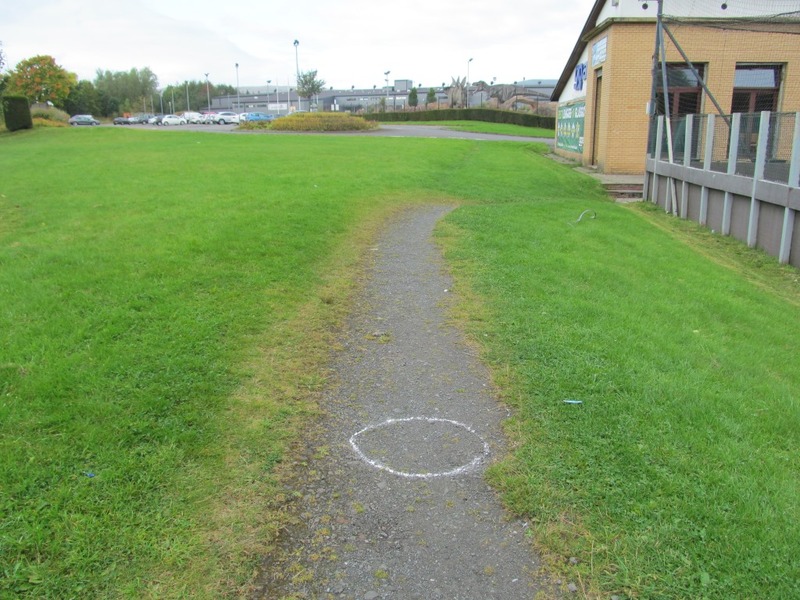 Also in Clydebank is another site which Mann is intrinsically connected to – the Cochno Stone (for background, see a previous post on this blog). Mann’s intervention here was not typical – it wasn’t an excavation. Rather, he took an interest in the esoteric patterns he saw on this rock – spirals, weird symbols, crosses, and stars. In order for visitors to better appreciate the stone in 1937 Mann painted the symbols with a white organic mixture (and perhaps other colours too). Overlain on the prehistoric markings was a measured and complex grid system of his own devising which helped him interpret the code. Mann was by now obsessed with the mathematical and astronomical properties of such symbols and it is almost certain many of the shapes he painted on the stone were fantasies of his own construction. He began to find what he wanted to find. As a result of the activities of certain antiquarians who have expended much care on the decoration of the monument, a considerable amount of public interest has recently been directed to the stone, with the result that large numbers of people from the surrounding industrial district and elsewhere are in the habit of visiting the site, particularly at week-ends, where it is the destination of an almost constant stream of sightseers. As a result considerable damage is being done by the behaviour of persons who are attracted more by curiosity than antiquarian interest. And when I opened a small trench over the stone in early September, evidence of this damage was very clear, with graffiti, perhaps carved just before the stone was finally buried in the Spring of 1965, and black paint splattered over the surface of the rock-art. Here, Mann had enthused the public about a prehistoric monument to the extent that the establishment had to intervene. He was too successful. He had not predicted the hunger for this kind of thing. But the wider message seemed to be that a little knowledge was a dangerous thing where the wider public was concerned. And so attacks of Mann’s abilities and theories began in archaeological circles and the press. His prehistoric Glasgow began to fall apart. 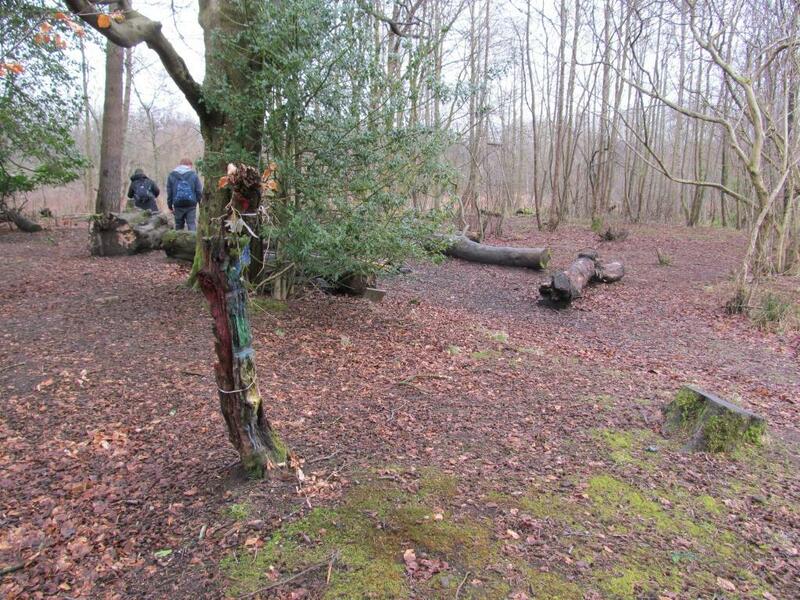 Plans were set in place to protect the Cochno Stone – from Glaswegian visitors and from Mann himself. 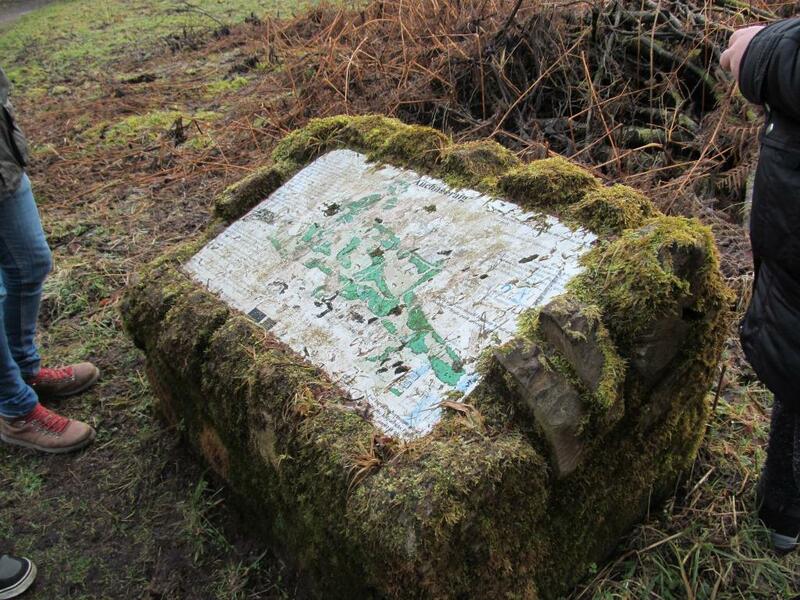 A decade after Mann’s death the wall around the Cochno Stone was kicked over. Earth was dumped on it. Landowners and the Ministry finished it. 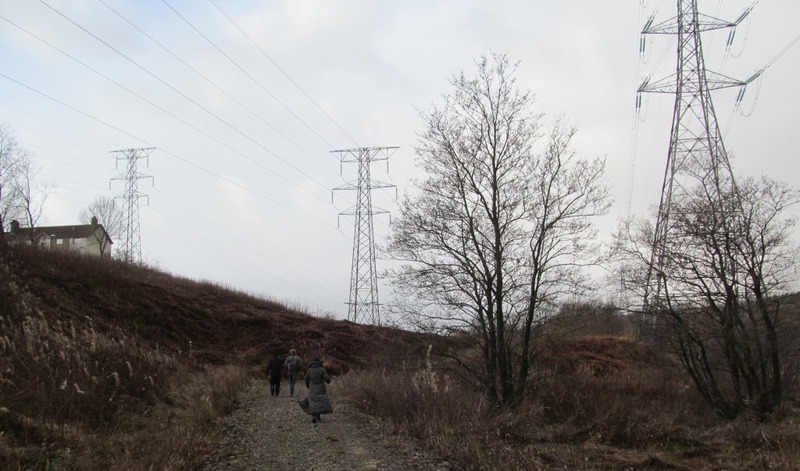 This paper comes at an early stage in my Walking Ludovic Mann project and in the coming months and years I intend to visit – and walk between – a wide range of locations of significance to Mann’s prehistoric Glasgow. Previous blog posts have reported on work Mann did outwith the city – Ferniegair cist cemetery for instance in South Lanarkshire, and Townhead Neolithic settlement on Bute. But I now want to retreat back to the city, to retrace the work of Mann with my feet, to see what remains of his secret grid and his sacred geometry beneath the fabric of this modern city. The discoveries of Ludovic Mann in essence sketched out the structure of prehistoric Glasgow. A Glasgow before it was Glasgow. His eccentric research and eclectic interests allowed a different way of thinking about familiar Glasgow streets, landmarks and place names. A map within a map. A city within a city. A secret map. A secret city. Mann’s underground city, Glasgow inverted, Glasgow’s past dragged back into the present, raised from the dead. Passing through wormholes. Tears in space and time. Prehistoric Glasgow revealed – for all to see – if they care to look. 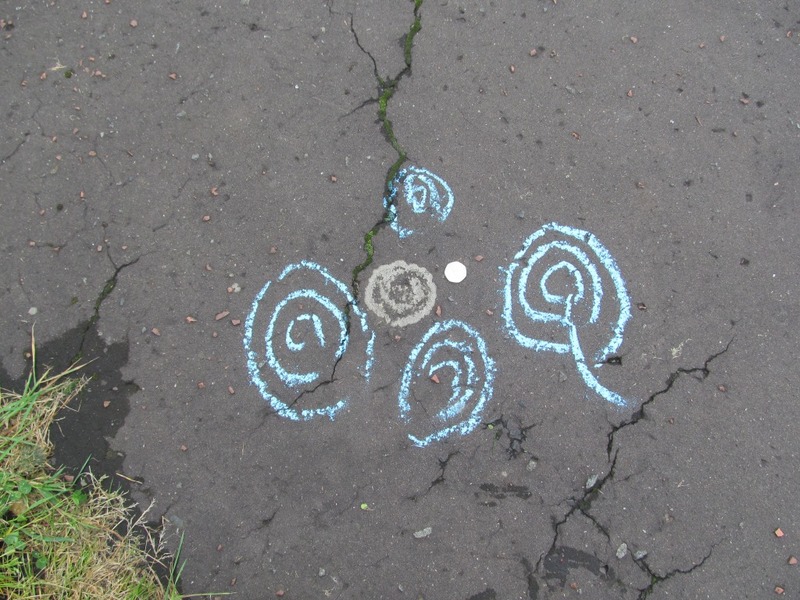 Walk and talk and chalk Ludovic McLellan Mann’s Glasgow. Sources and acknowledgements: much of the biographical information in this lecture came from Graham Ritchie’s excellent paper Ludovic McLellan Mann (1869–1955): ‘the eminent archaeologist’, published in the Proceedings of the Society of Antiquaries of Scotland volume 132, pages 43-64 (2002). If you google it, you can find this article freely available online. The front cover of the Mann pamphlet and the route to get to and from Knappers were sourced thanks to this really helpful webpage which has scanned and reproduced various ‘earth mysteries’ books and pamphlets. Various images, sourced from the former RCAHMS, have been reproduced under their creative commons policy with image codes in the captions. Between 7th and 9th September 2015, the Cochno Stone was revealed for the first time in 51 years – albeit only for 36 hours. The results of this small-scale excavation are simple, yet exciting. It is important that the results of the work we did, and the recommendations I am making for future work at the Stone, are made as widely available as possible. And so my full report on the excavation can be found below in this blog post. The Cochno Stone, West Dunbartonshire, is one of the most extensive and remarkable prehistoric rock-art panels in Britain. It was however buried by archaeologists in 1964 to protect it from ‘vandalism’ associated with visitors and encroaching urbanisation. A proposal has been developed to uncover the Stone, and laser scan it, to allow an exact replica to be created and placed in the landscape near where the original site is. In order to do this, it was felt that an initial trial excavation should take place (Phase 1) in order to assess the condition of the Stone and the nature of its burial. This work was undertaken in early September 2015. 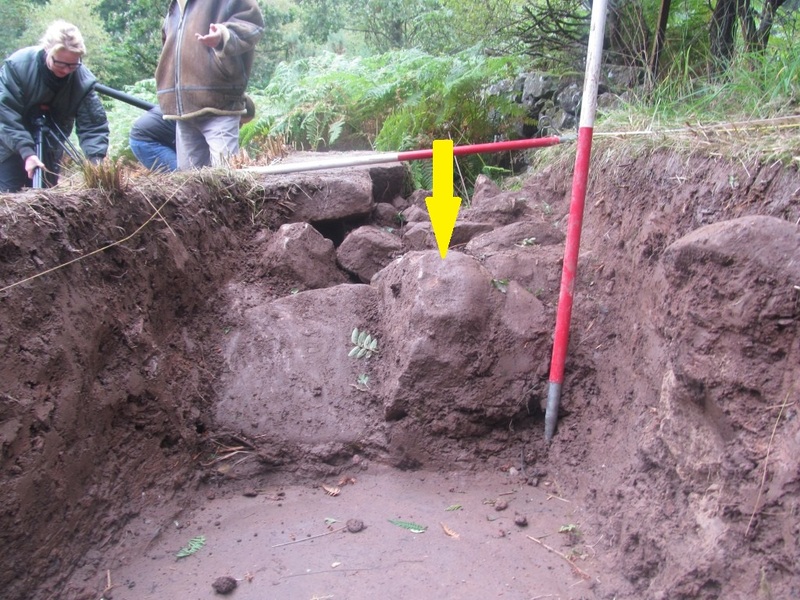 The Cochno Stone was found to be buried less deeply than claimed, and the wall surrounding it appears to have partially collapsed or been pushed over. The Stone itself was uncovered and rock-art, as well as 20th century graffiti and damage to the Stone, was recorded. Recommendations for the next phase of the project can now be made and the future plans for the Stone opened up for dialogue. The Cochno Stone (aka Whitehill 1; NMRS number NS57SW 32; NGR NS 5045 7388), West Dunbartonshire, is located at the foot of the Kilpatrick Hills on the north-western edge of Glasgow, in an urban park in Faifley, a housing estate on the north side of Clydebank. It is one of up to 17 panels of rock-art in this area (Morris 1981, 123-4) but by far the most extensive. The outcrop measures some 13m by 8m, is covered in scores of cup-marks, cup-and-rings marks, spirals and other unusual motifs. The surface is undulating, sloping sharply to the south, and is a ‘gritstone’ or sandstone. It was buried for ‘protection’ from vandalism in 1964. Evidently the district in which these sculpturings have been found, lying as it does on the pleasant slopes of the Kilpatrick hills, and commanding an extensive view of Clydesdale, had been a favourite resort of these ancient rock-engravers; and it is my hope that, in the course of time, with a little labour, more of these mysterious hieroglyphics may be brought again to the light of day, and perhaps the veil that shrouds from us their meaning may be withdrawn (Harvey 1889, 137). John Bruce produced a review of other rock-art sites in the region which was published in PSAS in 1896, and here he included a new sketch of the stone by W. A. Donnelly, this time showing (apparently) all of the stone rather than one part of it. There are some notable differences here from Harvey’s depiction (above) of the triple cup-and-ring mark arrangement. Donnelly’s drawing was the basis for Ronald Morris’s own sketch plan (see image 7) although Morris was dismissive of its reliability based on his own observations (1981, 124). 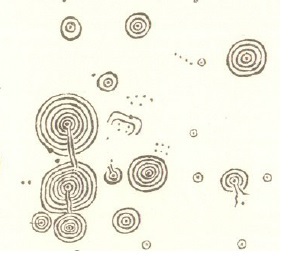 Image 2: Sketch of the Cochno Stone by W A Donnelly (dated 1895), which was reproduced in slightly different format by Bruce (1896) – image 3 – then rationalised by Morris (1981) – image 7. Two features which had not hitherto been observed, viz., a cross within an oval border and a sculpturing resembling two pairs of footprints, which, curiously enough, show only four toes each, both being incised in the rock, casts of which can now be inspected, prepared by Mr Adam Miller, Helensburgh (Bruce 1896, 208). Some international parallels for these symbols were found and they were considered as being contemporary with the prehistoric rock-art as opposed to modern editions. However, it is as likely that the cross and petrosomatoglyphs are much more modern additions. The fate to the casts is unknown sadly. Soon the stone became something of a tourist attraction, and a wall with at least one style was constructed around it at some point to control entry. The few photos of the Cochno Stone (such as image 9) – mostly from the 1930s – show visitors walking over the stone, usually from learned societies, and this may well have contributed to damage to the Stone which subsequently led to its burial. The Stone became the renewed focus for archaeological attention in the mid-1930s when Ludovic Mann took an interest in it, located as it was relatively close to the remarkable Knappers prehistoric site on what is now Great Western Road (Mann 1937a, 1937b). Mann infamously ‘painted’ the motifs white to make them clearer, apparently for a visit of the Glasgow Archaeological Society in 1937 (Ritchie 2002, 51). Mann added his own speculative grid as well (see image 12) and it likely that other motifs he painted onto the rock were fanciful on his part. Some black and white photos of the Stone at this time suggest two colours were used. There was clearly a growing concern from this point onwards that the Stone was under threat, from visitors walking on the Stone, but also vandalism. A hint of this is evident in the rare image (pre 1937?) 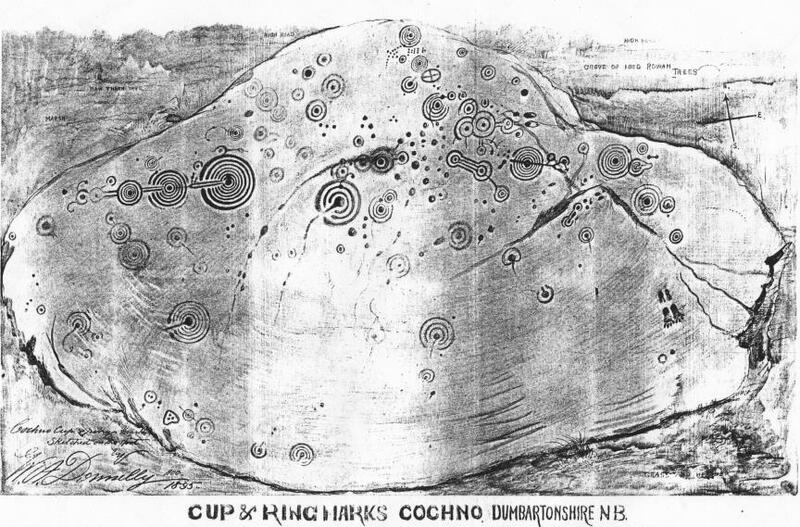 above showing a carved P H on the surface of the Cochno Stone beside the remarkable triple cup-and-ring arrangement shown in Harvey’s original sketch (image 1). And thus in 1964, the stone was buried, although the circumstances of this act remain shrouded in mystery. The vandals were later identified in the same book as ‘from near-by towns’. Others repeated this story over the years since, naming Glasgow University as the driving force behind the burial and suggesting up to 1m of soil covered the Stone. Euan MacKie (in MacKie and Davis 1988-89, 127) noted that the Stone has been “buried for some years for its own protection” although a recent email conversation with Euan suggests he was not privy to the act of burial itself. Therefore the details of the burial of the Stone, and potentially other rock-art panels in the vicinity, requires further research. 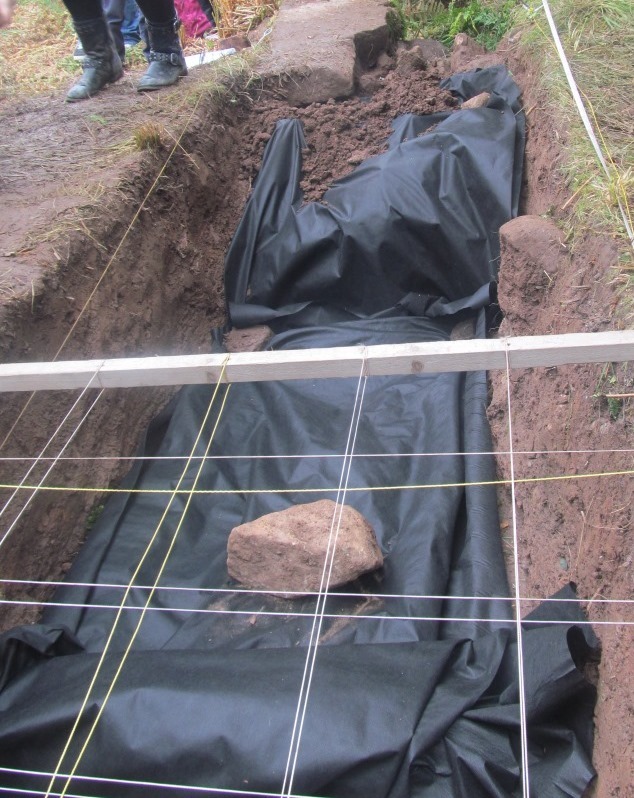 The first phase of work was carried out in order to allow a small section of the Cochno Stone to be exposed, under conditions akin to an archaeological watching brief. This small-scale excavation was viewed as being vitally important in establishing some baseline conditions ahead of the proposed more extensive phase 2 of the project. What condition is the Cochno Stone in? Has the overlying topsoil had a detrimental effect on the stone? Could any damage be reversed or stopped? How deep is the topsoil? What is the nature of this material (soil, turf, stone content)? How easy is it to remove from the surface of the stone? How clearly visible are the motifs and can these be matched to previous drawings and records? How accurate are the old drawings we have? How was the stone buried and what happened to the wall that has been pictured around it? This work was undertaken over three days, 7-9th September 2015, with a small team of students from the University of Glasgow; also present were Ferdinand Saumarez Smith of Factum Arte, and Richard Salmon, stone sculptor, who was on hand to assess the condition of the stone. The process was documented by film-maker May Miles Thomas. In advance of the excavation, weed and vegetation clearing was required to allow access to the site and trench location. A small trench 4m by 1m was opened by hand on the north side of the stone, with turves, and the topsoil removed by a combination of mattocks, shovels and spades. At this end of this process, the site was re-instated through the replacement of soil and turves. 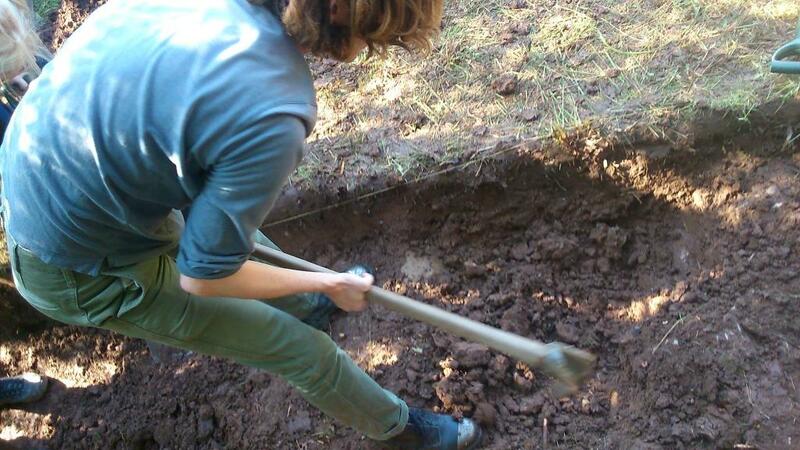 A trench 4m by 1m was opened by hand on the north side of the stone, with long axis north-south. The trench ran from the northern extent of the stone (in the form of the remnants of the boundary wall). Due to the unreliable drawings of the stone that exist, the exact location of the trench in the context of the stone remains unclear. Image 7: The red box indicates the approx. 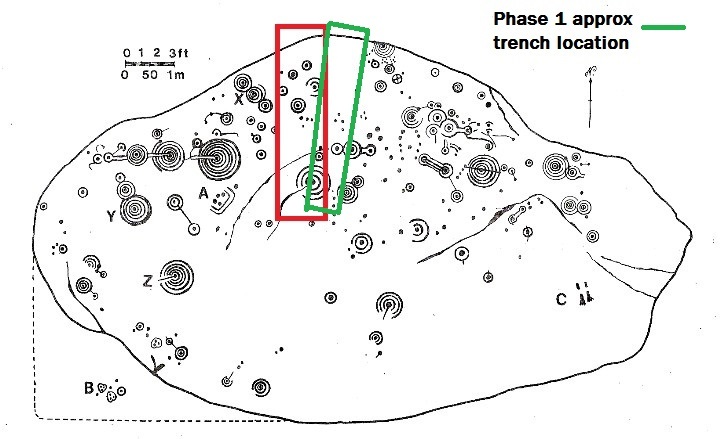 location of the planned trench, and the green box may be roughly where the trench actually sat in relation to the stone, with a void in the northern half of the trench (Stone drawing is Morris 1981 version of the original Donnelly sketch). The topsoil that the stone was buried in was mid-brown clay silt with infrequent pebble inclusions, and for the most part had the character of re-deposited plough soil. The occurrence of brick fragments, rusted metal nails, broken ceramic and glass in this soil layer suggests that this was transferred from a field nearby rather than derived from the immediate vicinity. The soil varied in depth from 0.5m towards the top of the stone, to 0.7m at the south end of the trench, which suggests the 1m depth occasionally quoted may only apply to the southern downhill portion of the stone. No indication was found of anything placed between the stone and the soil. It is clear that the drystone wall which surrounded the stone is still there, albeit in a ruinous state. The top of the wall had been pushed, or fallen, over, but the lower section of the wall appears to be intact. Remnants of a stone style were also discovered, some of which was visible on the ground surface before the excavation commenced (and can be seen in image 9, above). This raises concerns that the wall was pushed onto the stone during the burying process and it may be that the stone itself has been damaged by this. We did not remove the wall rubble to assess this due to time constraints. But there did not appear to be a layer of topsoil between wall rubble and stone surface, only material that had trickled beneath. The stone was revealed in the afternoon of the first day of work, at varying depths beneath the surface and running beneath the wall rubble in the northern end of the trench. After the surface of the Stone was reached, heavy tools were removed from the trench and we continued to clean down to the Stone surface using trowels and then soft-bristle brushes. Water was poured on the Stone to assist cleaning and a water pump was used to remove excess water. 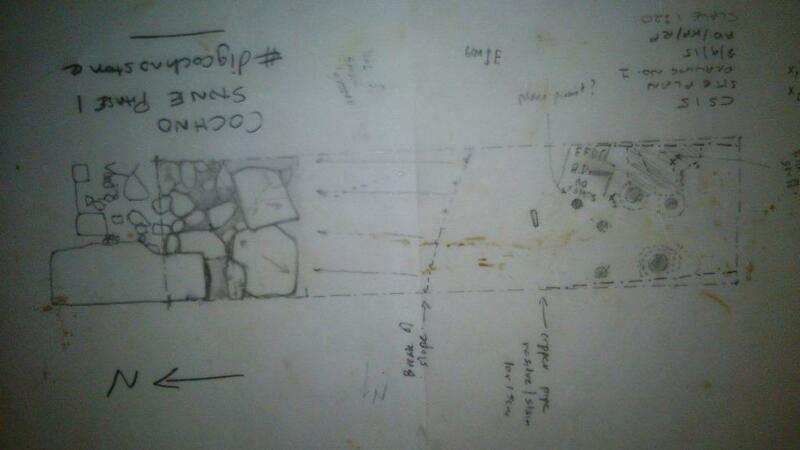 The Cochno Stone was recorded via a sketch plan (image 8) and a photographic render produced by Factum Arte (image 14) which shows most clearly the motifs that were uncovered. Six or seven cup-marks were evident, two of which had rings around them (one two, the other possibly three) and a further faint putative ring was identified at a third cup. The marks were all deeply incised and quite coarse in quality (cups up to 25mm in depth and 50mm in diameter), and in remarkably good condition given the burial of the stone and previous exposure for several thousand years. It was possible to determine small pecking marks in and around at least one cup-mark, suggesting the means of producing the marks may be revealed through further analysis. It may also be possible to identify phasing between one cup-mark and adjacent cup-and-ring mark which appear to overlap, as was the case at nearby Greenland (Mackie & Davis 1988-89). A short section of metal pipe was found adhered to the rock surface, leaving a stain when removed; this likely ended up on the stone during the burial process. White flecks identified within one cup-mark may be remnants of Mann’s white paint, but no other sign of this was identified, suggesting an organic liquid was used rather than a chemical paint. These flecks were sampled for further analysis. A small red patch, about 20mm across, was noted adhering to the surface of the stone. This had the character of a paint of some kind, and adhered closely to the stone; no sample could be collected as this was so closely bonded to the stone; this could relate to another colour of paint used on the stone by Mann, or be the remnant of some kind of vandalism. A large black blob was found towards the SE corner of the trench. This had the character of pitch, tar or melted plastic, and was sampled for further analysis. The irregular pattern of this deposit suggested it melted in situ or is some kind of ‘splatter’. This overlay at least two cup-marks and edges of rings. Image 15: Cup-mark containing white flecks – Mann’s paint remnants? 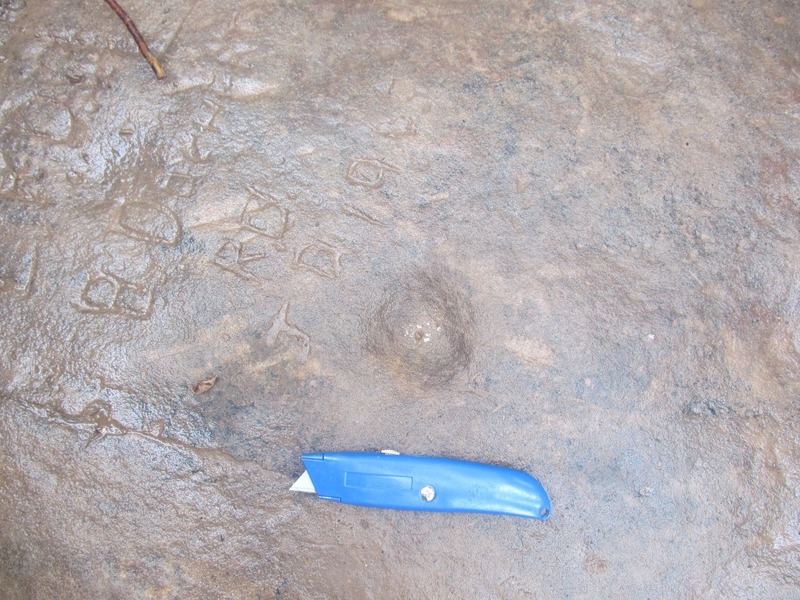 During the course of the excavation, a few marks were also made on the surface of the Stone with a mattock. This highlights the softness of the stone, and once this happened, heavy tools were abandoned. One consequence of this was that we wore no shoes in the trench , and so we have to consider that even walking across the Stone may cause damage to its surface. Image 17: Protecting the Stone before back-filling commenced. At the end of the excavation, the stone and wall were covered in a double layer of geotex, and the trench was backfilled and re-turved by hand. The Cochno Stone remains in very good condition despite being buried and so a project to uncover and record the Stone is considered to be feasible and of great value. The local community should be consulted at all stages of the development of phase 2 of the project and any subsequent outcomes from the Cochno Stone project. The exposure of the Cochno Stone can be done by machine, but under very close supervision and with various mitigating factors in place e.g. plastic or rubber blade on the bucket, machine stays out with the perimeter wall. The rock is very soft and therefore hand excavation should avoid metal tools where at all possible – appropriate tools and brushes will need to be identified. Consultation with archaeologists who have worked on other rock-art panels will be imperative to share best practice. It is likely that existing drawings of the Cochno Stone are inaccurate (what we found cannot be located on Donnelly’s drawing) and therefore a full and detailed new drawing is urgently required. A suitable individual to do this should be identified. Phasing of rock-art cannot be ruled out, and we may be able to establish the means by which the rock-art was carved into the rock. Methods to deal with both areas of enquiry should be developed. 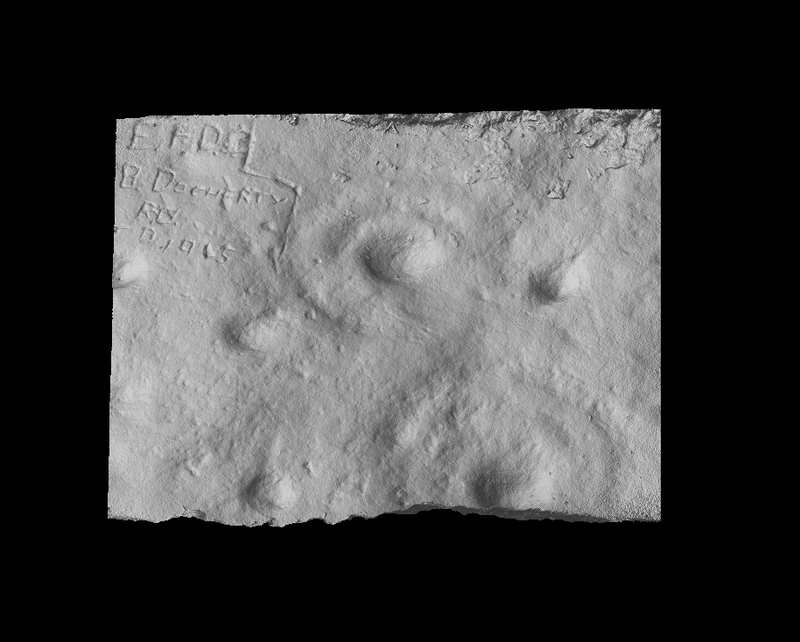 Initial photogrammetry suggests high resolution recording techniques will reveal more about the Stone than observation with the naked eye and therefore techniques such as this and laser scanning will be of fundamental importance. We must consider the possibility that the perimeter wall collapse has caused some damage to the edges of the Stone; the removal of wall rubble will add to the time and cost of the final excavation. 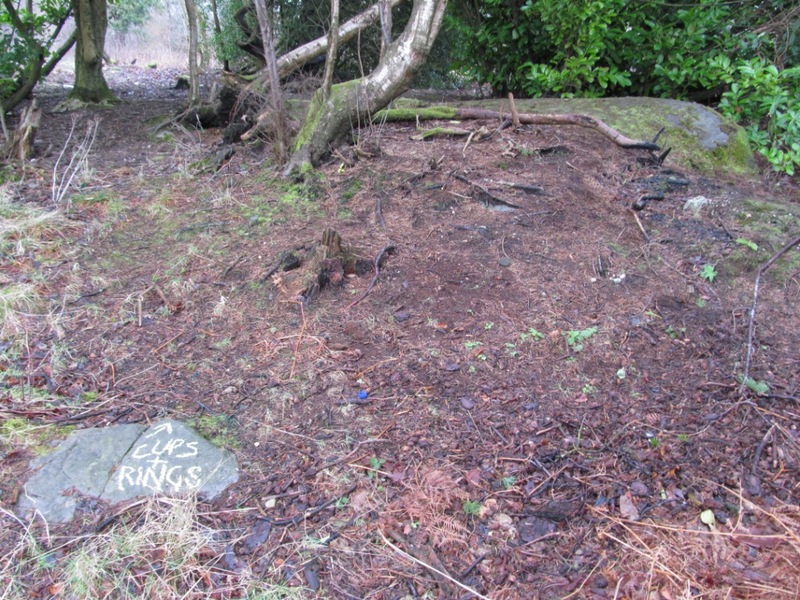 A rough sample – our trench (and the P H carving on one photo) – suggests that the Cochno Stone is heavily vandalised – and the damage to the Stone will include graffiti but also paint splatters and wear from visitors walking on the stone. The removal of chemical and other substances from the Stone (if desirable) will add to the cost of the project. Ludovic Mann’s ‘paint’ has largely disappeared; but traces may still remain and so we should not discount this from project designs. Research to connect Mann’s work at Cochno with Knappers would also be of great value. The story and circumstances of the burial of the Stone – and others in the park – need to be investigated as a matter of urgency to help inform the phase 2 excavation, find other rock-art panels and add to the modern story of the Stone. Pictures and other images of the Stone before its burial. 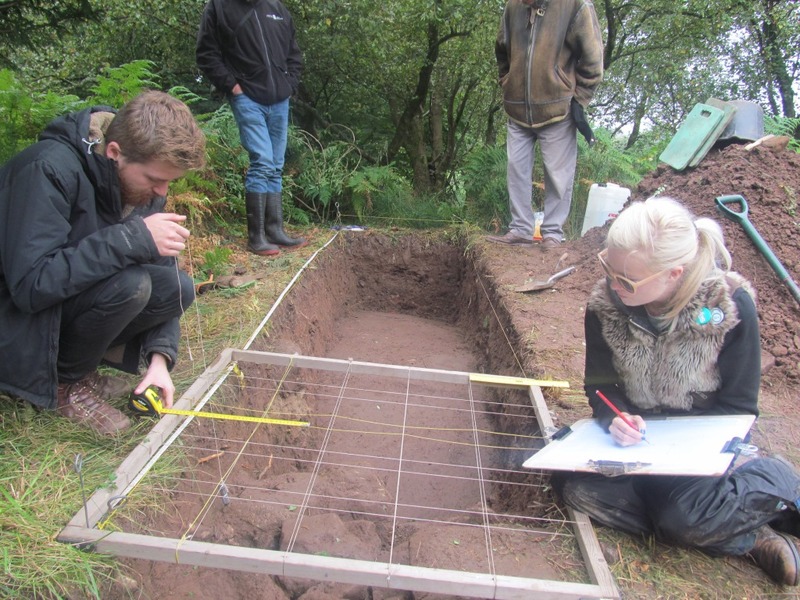 A small team of very hard working students gave up a few days of their time to work at the Cochno Stone which was very much appreciated – Liam Devlin, Alison Douglas, Taryn Gouck, Rebecca Miller, Joe Morrison, Rory Peace and Katherine Price. Helen Green visited several times with her thoughts for phase 2 and other Glasgow PhD students – Tom Davis, Jamie Barnes and Dene Wright popped in with useful suggestions. Thanks also to project partners Ferdinand Saumarez Smith and Richard Salmon for help and advice throughout the process, and May Miles Thomas was a constant source of encouragement, and documented the process. 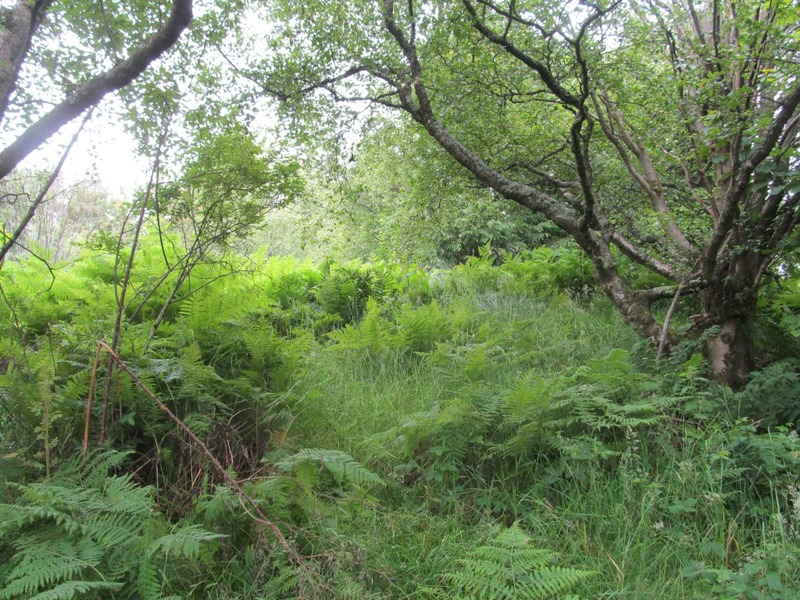 Thanks to West Dunbartonshire council for permission to carry out the work and for ensuring access to the excavation site by strimming weeds and vegetation. John Raven of Historic Scotland has offered support and advice throughout the process and ensured permission was secured to excavate this scheduled ancient monument. And thanks too for Mrs Marks, owner of the east half of the Stone, for visiting and entering discussions with us about the future of the Stone. I would also like to thank John Reppion for drawing my attention to the word petrosomatoglyph! Most of all, thanks to all of the local people who have kept alive memories of the Cochno Stone, many of whom of all ages came and visited our dig: this project is dedicated to all of you. Mann, L M 1937a An appeal to the nation: the ‘Druids’ temple near Glasgow: a magnificent, unique and very ancient shrine in imminent danger of destruction. London & Glasgow. Mackie, E W and Davis, A 1988-89 New light on Neolithic rock carving. The petroglyphs at Greenland (Auchentorlie), Dumbartonshire’, Glasgow Archaeological Journal 15, 125-55. Morris, R W B 1981 The prehistoric rock-art of southern Scotland (except Argyll and Galloway), Oxford: BAR British Series 86. References with * are free to view online – just google the title.